Dedicated to Lord Ganesha, “The God of Knowledge” is a temple located in Maharashtra known as Shri Moreshwar/Mayureshwar Mandir. 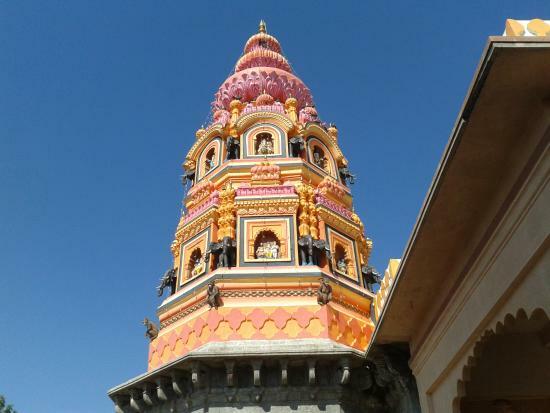 This temple is situated in the Pune district in a village called Morgaon. This temple also belongs to a group of eight highly esteemed Ganesh temples in the country known as “Ashtavinayaka”. In addition, this temple is also said to be the starting point of the “Ashtavinayaka” pilgrimage circuit. Furthermore, this temple is said to have prospered during the Peshwa dynasty as well under the patronage of the descendants of renowned saint Morya Gosavi. There are three routes from Mumbai to this temple, and they are via Bangalore-Mumbai Highway/Mumbai Highway/Mumbai-Pune Highway. There are three routes from Navi Mumbai to this temple, and they are via Bangalore-Mumbai Highway/Mumbai Highway/Mumbai-Pune Highway, via Bangalore-Mumbai Highway/Mumbai Highway/Mumbai-Pune Highway and Phule Nagar Akluj Road, and via Bangalore-Mumbai Highway/Mumbai Highway/Mumbai-Pune Highway and Shirur-Satara Road. There are three routes from Nashik to this temple, and they are via MH SH 50 and Shirur-Satara Road, via Shirur-Satara Road, and via Maharashtra State Highway 30. There are two routes from Nagpur to this temple, and they are via Nagpur-Aurangabad Road and via Nagpur-Aurangabad Highway and Nagpur-Mumbai Highway. A popular folklore is associated to the construction of this temple. According to this popular myth a demon called Sindhu born to King Mithila began terrorising the three worlds. In response the gods in fear asked Lord Ganesha to deal with this demon, which resulted in a fierce battle between Ganesha and the demon and his army. During the battle Ganesha managed to tear the body of the general of the demon’s army into three pieces, and then cut open the body of Sindhu thereby killing him. It was then at the site at which this demon was killed by Ganesha that this temple was eventually built by apparently Brahma the creator.